When I worked at PGA Magazine the organization was very involved in the PGA Merchandise Show, an annual event held in late January in Orlando, Florida. Though the PGA Merchandise Show was produced by Reed Exhibitions, we partnered with Reed on several programs to maximize the show’s impact and interest to the target audience, golf professionals, by finding new ways to bring these golf professionals together with companies in the industry. 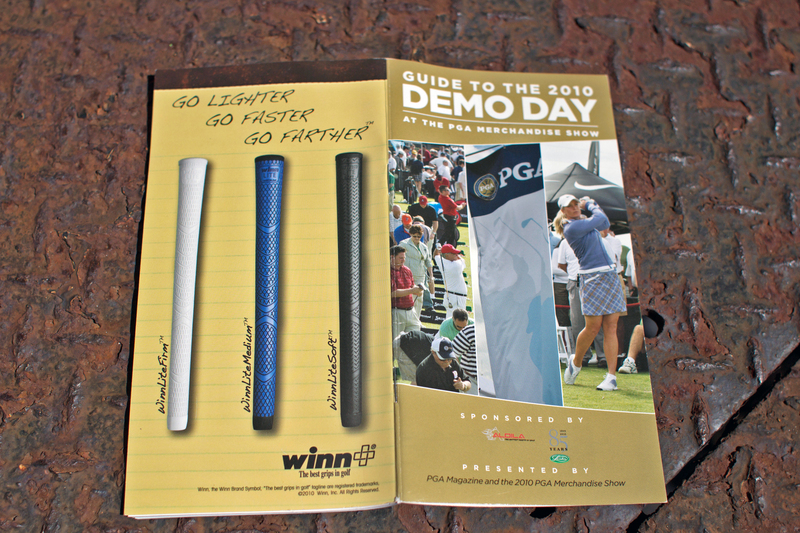 Demo Day at the PGA Merchandise Show, 2010. Demo Day at the PGA Merchandise Show, 2009. Guide to Demo Day by PGA Magazine, 2010 PGA Merchandise Show. The production of the Guide to Demo Day, a 44-page booklet handed out to attendees featuring sponsors, lists of participating companies, maps, special events, and more. The Guide to Demo Day also included advertising, and I was responsible for coordinating the ad traffic for this publication. The production of extensive signage (including signs detailing much of the above). Coordinate and ensure the shipping and receiving of all deliverables, including signage, the printed Guide to Demo Day, and flagpoles, flags, and more. Once we got to Florida, my colleagues and I participated in setting up all of the signs (there were about 100 new signs every year), setting up tents, placing and assembling flagpoles, and more. It’s very windy in Florida, so everything needs to be secured with tent stakes, sandbags, water-filled bases, and more. On the Wednesday of Demo Day my colleagues and I would arrive by 4:30 a.m. to put the finishing touches on the event before attendees began showing up at 9:00 a.m. I never stayed to see an entire Demo Day because I needed to head back to the convention center to set up my employer’s other show presence for when the PGA Merchandise Show opened the next day. You can read about that work here.